Sleeping peacefully every night is important to your health, and the health of your loved ones. In fact, habitual snorers can be at risk of serious health problems, including sleep apnea. 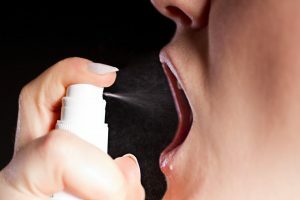 Anti-snoring sprays have been on the market for some time and do work for some people to stop their habitual snoring. Some sprays may work better for you than others. Also, as you will notice, some anti-snoring sprays are made from all-natural ingredients, while others are not. This may be something to consider when choosing the best one for you. SnoreStop is a widely used brand in the anti-snoring market. Their Extinguisher Throat Spray has 120 sprays per 0.6 oz bottle. To use, you simply spray it into your mouth and onto the back of your throat. This FDA approved anti-snore spray has only homeopathic ingredients and has been rated A+ by users, as it eliminates the effects and symptoms of snoring naturally. Since it has no harmful chemicals included, it has no side effects and is not habit forming. Best yet, since it is widely used, it has published studies by Doctors worldwide and has a high rating with the Better Business Bureau (BBB). Ayr anti-snoring spray is comprised of the best blend of essential oils, herbs, and other natural ingredients to prevent the frequency and loudness of snoring. Best yet, the essential oils and herbs used in Ayr Snore Relieving Throat Spray also aid in sleep, allowing for a peaceful night’s rest for up to eight hours. This brand has good reviews from users, as well. ProfesSnore Anti-Snoring Spray has only four natural ingredients: mineral oil, glycerin, eucalyptus oil and spearmint oil. It is drug-free and non-habit forming which makes it perfect for long-term use without the risk of dependency. It has been clinically tested to be effective and safe to use. This spray works by preventing the vibrations in the throat that cause snoring. To use, spray to the back of the throat. Don’t eat or drink after spraying. ProfesSnore Anti-Snoring Spray lasts about 4 – 5 hours. Rhynil is made from all-natural ingredients and herbs. It’s an effective, strongly formulated mouth and nose spray to stop the symptoms of snoring. Furthermore, it aids in keeping infectious conditions of the nasal passage at bay. This anti-snoring spray also has anti-bacterial, antiseptic and anti-inflammatory properties that fight many other major and minor problems of the nasal passage and sinuses. Another popular brand is Breath Right, and they have an effective anti-snoring spray, as well as their nasal strips. To use, you simply spray 3 times to the back of the throat about 30 minutes before heading to bed. After spraying, do not eat or drink for the best results. This anti-snoring spray is considered quite effective by its users. Silence is made of mint flavored, muco-adhesive foam. Also, it contains many other ingredients which are known to inhibit snoring. To use, shake the can well and spray several times on the back of the throat. You can swallow which allows it to cover the entire throat. Wellness has a Zinc Throat Spray along with an Herbal Throat Spray. Both have been proven to be effective in stopping the symptoms of snoring. To use, spray it 2 – 3 times to the back of the throat. What makes this spray good is that it can be used throughout the day to soothe your throat and to make it a more effective anti-snoring agent. However, do not use it more than 3 times per day or not more than 26 sprays in a 24-hour period. There you have it; the best anti-snoring sprays available on the market today. However, it is important to remember that not all these sprays will work for everyone. Ask for the advice of your doctor to find the best anti-snoring spray or method for you. And, anti-snoring sprays are not a cure for serious conditions, such as sleep apnea. Please remember to speak with your doctor or a sleep specialist for severe conditions. It’s also great to realize that some bad habits can affect snoring and your sleep patterns. Eating before bed, being overweight and smoking are only a few of these habits. Changing your lifestyle for the better can lead to a better night’s sleep!